I'm a person who doesn't like to eat the same thing twice in a month (or two or three). A few of my friends at the office have expressed interest in my meal choices, so I've decided to try something in honor of them. Each week I will post one of the recipes I'm making for dinner. I try new recipes often, so if I post one and it's a bust--I'll let you know. I'll start off with a delicious recipe,which I made tonight, taken from the label of Thai Kitchen Red Curry Paste (find it in the Asian section of your grocery store). Simmer 1 can (14 oz) Coconut milk with 1-2 Tbsp. 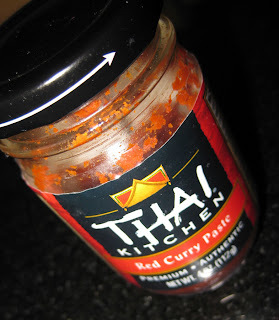 Thai Kitchen Red Curry Paste over medium heat for 5 minutes. Add 1 Tbsp. Fish Sauce, 2 Tbsp. brown sugar, 1/2 cup frozen peas (or fresh snap pea pods), and 1/3 cup water (I also added sliced frozen carrots and a can of bamboo shoots, and I think partially boiled potatoes would be good too). Simmer 10 minutes, stirring occasionally. Stir in 1/2 pound fresh shrimp [or bite-sized cooked chicken] and continue cooking 3-5 minutes, until shrimp are cooked. Garnish with fresh basil and cilantro. Serve with rice. YAY!! Thanks for posting, Christy :) I can't wait to try this one out. I hope my brother is appreciating all this cooking!! if not we'll have him live off leftovers for a month! you are great.. i may have to steal some recipes..